P.O.D. have announced headline tour dates in the US for the Fall in support of their upcoming album, Circles. In select markets, each concert ticket will come with a FREE digital download of the album! P.O.D. 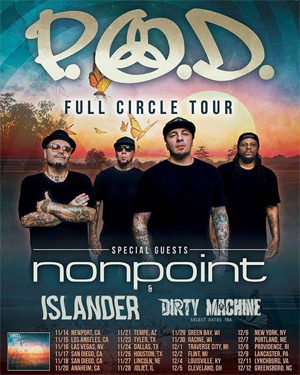 will be supported on the tour by NONPOINT, ISLANDER and DIRTY MACHINE on select dates. Tickets will go on sale this Friday, October 5, at 10AM EST from the band's web site PAYABLEONDEATH.COM.